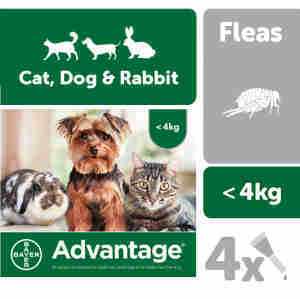 Advantage 40 for Small Cats, Dogs, and Rabbits up to 4kg, is for the prevention and control treatment of flea infestations and can be used on kittens aged 8 weeks and older. This flea treatment is ideal for cats or dogs with skin conditions who require bathing as it works even when it's wet, meaning there is no need for reapplication. Advantage 40 kills most fleas within a day of treatment. It can also stop further flea problems for up to three to four weeks in cats and one week in rabbits. can be used on kittens aged 8 weeks and older. Treatment should be applied topically every month. Advantage 40mg for Small Cats, Small Dogs and Rabbits contains 4 applications providing 4 months protection. Each tube contains 0.4ml (40mg imidacloprid). The product also contains benzyl alcohol and butylhydroxytoluene (E321) as an antioxidant. Protect your cat from fleas by administering this treatment once a month. It is recommended that you also treat your home if your cat has had fleas. This will help to prevent your cat from any remaining fleas and their larvae. So far, we have found the Advantage flea treatment to be completely effective. It is great to have the option for smaller cats, as the less chemicals the better in my opinion. Quick delivery and fast results. The best treatment we’ve tried for our cat who has a flea allergy. Very pleased with this product, used on dogs , and my cats , very pleased with the results. Used this product several times now, very effective in my opinion best flea treatment without having to get prescriptions.